For other uses, see Manta Ray (disambiguation). Manta rays are large rays belonging to the genus Manta. The larger species, M. birostris, reaches 7 m (23 ft) in width, while the smaller, M. alfredi, reaches 5.5 m (18 ft 1 in). Both have triangular pectoral fins, horn-shaped cephalic fins and large, forward-facing mouths. They are classified among the Myliobatiformes (stingrays and relatives) and are placed in the family Myliobatidae (eagle rays). Mantas are found in warm temperate, subtropical and tropical waters. Both species are pelagic; M. birostris migrates across open oceans, singly or in groups, while M. alfredi tends to be resident and coastal. They are filter feeders and eat large quantities of zooplankton, which they gather with their open mouths as they swim. However, research suggests that the majority of their diet (73%) actually comes from mesopelagic sources; that is, they are actually deep sea predators, feeding on fish and other organisms that inhabit areas of the sea between 200–1,000 metres (650–3,330 ft) below the surface. Gestation lasts over a year, and mantas give birth to live pups. 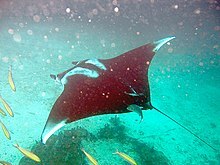 Mantas may visit cleaning stations for the removal of parasites. Like whales, they breach for unknown reasons. Both species are listed as vulnerable by the International Union for Conservation of Nature. Anthropogenic threats include pollution, entanglement in fishing nets, and direct harvesting for their gill rakers for use in Chinese medicine. Their slow reproductive rate exacerbates these threats. They are protected in international waters by the Convention on Migratory Species of Wild Animals, but are more vulnerable closer to shore. Areas where mantas congregate are popular with tourists. Only a few public aquariums are large enough to house them. Manta rays are members of the order Myliobatiformes which consists of stingrays and their relatives. The genus Manta is part of the eagle ray family Myliobatidae, where it is grouped in the subfamily Mobulinae along with the Mobula devil rays. In 2017, an analysis of DNA, and to a lesser degree, morphology, found that Mobula was paraphyletic with respect to the manta rays, and they recommended treating Manta as a junior synonym of Mobula. Mantas evolved from bottom-dwelling stingrays, eventually developing more wing-like pectoral fins. M. birostris still has a vestigial remnant of a sting barb in the form of a caudal spine. The mouths of most rays lie on the underside of the head, while in mantas, they are right at the front. Manta rays and devil rays are the only ray species that have evolved into filter feeders. The scientific naming of mantas has had a convoluted history, during which several names were used for both the genus (Ceratoptera, Brachioptilon Daemomanta, and Diabolicthys) and species (such as vampyrus, americana, johnii, and hamiltoni). All were eventually treated as synonyms of the single species Manta birostris. The genus name Manta was first published in 1829 by Dr Edward Nathaniel Bancroft of Jamaica. The specific name birostris is ascribed to Johann Julius Walbaum (1792) by some authorities and to Johann August Donndorff (1798) by others. The specific name alfredi was first used by Australian zoologist Gerard Krefft, who named the manta after Prince Alfred. Authorities were still not in agreement and some argued that the black color morph was a different species from the mostly white morph. This proposal was discounted by a 2001 study of the mitochondrial DNA of both. A 2009 study analyzed the differences in morphology, including color, meristic variation, spine, dermal denticles (tooth-like scales), and teeth of different populations. Two distinct species emerged: the smaller M. alfredi found in the Indo-Pacific and tropical east Atlantic, and the larger M. birostris found throughout tropical, subtropical and warm temperate oceans. The former is more coastal, while the latter is more ocean-going and migratory. A 2010 study on mantas around Japan confirmed the morphological and genetic differences between M. birostris and M. alfredi. A third possible species, preliminarily called Manta sp. cf. birostris, reaches at least 6 m (20 ft) in width, and inhabits the tropical west Atlantic, including the Caribbean. M. birostris and it occur in sympatry. While some small teeth have been found, few fossilized skeletons of manta rays have been discovered. Their cartilaginous skeletons do not preserve well, as they lack the calcification of the bony fish. Only three sedimentary beds bearing manta ray fossils are known, one from the Oligocene in South Carolina and two from the Miocene and Pliocene in North Carolina. Remains of an extinct species have been found in the Chandler Bridge Formation of South Carolina. These were originally described as Manta fragilis, but were later reclassified as Paramobula fragilis. The two species of manta differ in color patterns, dermal denticles, and dentition. M. birostris has more angular shoulder markings, larger ventral dark spots on the abdominal region, charcoal-colored ventral outlines on the pectoral fins, and a dark colored mouth. The shoulder markings of M. alfredi are more rounded, while its ventral spots are located near the posterior end and between the gill slits, and the mouth is white or pale colored. The denticles have multiple cusps and overlap in M. birostris, while those of M. alfredi are evenly spaced and lack cusps. Both species have small, square-shaped teeth on the lower jaw, but M. birostris also has enlarged teeth on the upper jaw. Unlike M. alfredi, M. birostris has a caudal spine near its dorsal fin. Mantas move through the water by the wing-like movements of their pectoral fins, which drive water backwards. Their large mouths are rectangular, and face forward as opposed to other ray and skate species with downward-facing mouths. The spiracles typical of rays are vestigial, and mantas must swim continuously to keep oxygenated water passing over their gills. :2–3 The cephalic fins are usually spiralled, but flatten during foraging. The fish's gill arches have pallets of pinkish-brown spongy tissue that collect food particles. Mantas track down prey using visual and olfactory senses. They have one of the highest brain-to-body mass ratios and the largest brain size of all fish. Their brains have retia mirabilia which may serve to keep them warm. M. alfredi has been shown to dive to depths over 400 metres (1,300 ft), while their relative Mobula tarapacana, which has a similar structure, dives to nearly 2,000 metres (6,600 ft); the retia mirabilia probably serve to prevent their brains from being chilled during such dives into colder subsurface waters. The fertilized eggs develop within the female's oviduct. At first, they are enclosed in an egg case while the developing embryos absorb the yolk. After hatching, the pups remain in the oviduct and receive additional nutrition from milky secretions. With no umbilical cord or placenta, the unborn pup relies on buccal pumping to obtain oxygen. Brood size is usually one or occasionally two. The gestation period is thought to be 12–13 months. When fully developed, the pup resembles a miniature adult and is expelled from the oviduct with no further parental care. In wild populations, an interval of two years between births may be normal, but a few individuals become pregnant in consecutive years, demonstrating an annual ovulatory cycle. The Okinawa Churaumi Aquarium has had some success in breeding M. alfredi, with one female giving birth in three successive years. In one of these pregnancies, the gestation period was 372 days and at birth the pup had a width of 192 cm (76 in) and weight of 70 kg (150 lb). In southern Africa, M. birostris males mature at 4 m (13 ft) while females reach maturity slightly over that. :57 In Indonesia, M. birostris males appear to mature at 3.75 m (12 ft), while female mature around 4 m (13 ft). In southern Africa, M. alfredi matures at widths of 3 m (10 ft) for males and 3.9 m (13 ft) for females. :42 In the Maldives, males of M. alfredi mature at a width of 2.5 m (8 ft 2 in), while females mature at 3 m (9.8 ft). In Hawaii, M. alfredi matures at a width of 2.8 m (9 ft 2 in) for males and 3.4 m (11 ft) for females. 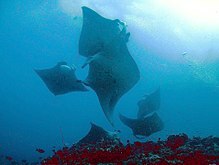 Female mantas appear to mature at 8–10 years. Manta rays may live as long as 50 years. Manta rays are filter feeders as well as predators. “We studied the giant manta rays’ diet using biochemical tests, such as stable isotope analysis,” said [Queensland University biologist Katherine] Burgess. “These tests can determine what animals have been eating by examining a piece of tissue from a muscle biopsy from a free-swimming animal.” These skins tests showed that an average of 27 percent of the giant manta ray’s diet came from surface plankton, and 73 percent came from what scientists call “mesopelagic” sources—a fancy term for fish and other organisms that inhabit areas of the sea between 650 to 3,330 feet (200 to 1,000 meters) below the surface. They consume large quantities of zooplankton in the form of shrimp, krill, and planktonic crabs. An individual manta eats about 13% of its body weight each week. When foraging, it slowly swims around its prey, herding it into a tight "ball", and then speeds through the bunched organisms with a wide-open mouth. If a ball is particularly dense, a manta may somersault through it. :13 While feeding, mantas flatten their cephalic fins to channel food into their mouths and the small particles are collected by the tissue between the gill arches. As many as 50 individual fish may gather at a single, plankton-rich feeding site. Mantas visit cleaning stations on coral reefs for the removal of external parasites. The ray adopts a near-stationary position close to the coral surface for several minutes while the cleaner fish consume the attached organisms. Such visits most frequently occur when the tide is high. In Hawaii, wrasses provide the cleaning; some species feed around the manta's mouth and gill slits, while others address the rest of the body surface. In Mozambique, sergeant major fish clean the mouth, while butterflyfishes concentrate on bite wounds. :160 M. alfredi visits cleaning stations more often than M. birostris. :233 Individual mantas may revisit the same cleaning station or feeding area repeatedly and appear to have cognitive maps of their environment. In 2016, scientists published a study in which manta rays were shown to exhibit behavior associated with self-awareness. In a modified mirror test, the individuals engaged in contingency checking and unusual self-directed behavior. Mantas are found in tropical and subtropical waters in all the world's major oceans, and also venture into temperate seas. The furthest from the equator they have been recorded is North Carolina in the United States (31°N) and the North Island of New Zealand (36°S). They prefer water temperatures above 68 °F (20 °C) and M. alfredi is predominantly found in tropical areas. Both species are pelagic. M. birostris lives mostly in the open ocean, travelling with the currents and migrating to areas where upwellings of nutrient-rich water increase prey concentrations. Fish that have been fitted with radio transmitters have travelled as far as 1,000 km (620 mi) from where they were caught, and descended to depths of at least 1,000 m (3,300 ft). M. alfredi is a more resident and coastal species. Seasonal migrations do occur, but they are shorter than those of M. birostris. Mantas are common around coasts from spring to fall, but travel further offshore during the winter. They keep close to the surface and in shallow water in daytime, while at night they swim at greater depths. Both commercial and artisanal fisheries have targeted mantas for their meat and products. They are typically caught with nets, trawls, and harpoons. Mantas were once captured by fisheries in California and Australia for their liver oil and skin; the latter were used as abrasives. Their flesh is edible and is consumed in some countries, but is unattractive compared to other fish. Demand for their gill rakers, the cartilaginous structures protecting the gills, has recently entered Chinese medicine. To fill the growing demand in Asia for gill rakers, targeted fisheries have developed in the Philippines, Indonesia, Mozambique, Madagascar, India, Pakistan, Sri Lanka, Brazil, and Tanzania. Each year, thousands of manta rays, primarily M. birostris, are caught and killed purely for their gill rakers. A fisheries study in Sri Lanka and India estimated that over 1000 were being sold in the country's fish markets each year. By comparison, M. birostris populations at most of the key aggregation sites around the world are estimated to have significantly fewer than 1000 individuals. Targeted fisheries for manta rays in the Gulf of California, the west coast of Mexico, India, Sri Lanka, Indonesia, and the Philippines have reduced populations in these areas dramatically. Manta rays are subject to other anthropogenic threats. Because mantas must swim constantly to flush oxygen-rich water over their gills, they are vulnerable to entanglement and subsequent suffocation. Mantas cannot swim backwards, and because of their protruding cephalic fins, are prone to entanglement in fishing lines, nets, ghost nets, and even loose mooring lines. When snared, mantas often attempt to free themselves by somersaulting, tangling themselves further. Loose, trailing line can wrap around and cut its way into its flesh, resulting in irreversible injury. Similarly, mantas become entangled in gill nets designed for smaller fish. Some mantas are injured by collision with boats, especially in areas where they congregate and are easily observed. Other threats or factors that may affect manta numbers are climate change, tourism, pollution from oil spills, and the ingestion of microplastics. In 2011, mantas became strictly protected in international waters because of their inclusion in the Convention on Migratory Species of Wild Animals. The CMS is an international treaty organization concerned with conserving migratory species and habitats on a global scale. Although individual nations were already protecting manta rays, the fish often migrate through unregulated waters, putting them at increased risk from overfishing. The IUCN declared M. birostris to be 'vulnerable with an elevated risk of extinction' in November 2011. In the same year, M. alfredi was also classified as vulnerable with local populations of fewer than 1000 individuals and little or no interchange between subpopulations. The Manta Trust is a UK-based charity dedicated to research and conservation efforts for manta rays. The organization's website is also an information resource for manta conservation and biology. Besides these international initiatives, some countries are taking their own actions. New Zealand has banned the taking of manta rays since the introduction of the Wildlife Act in 1953. 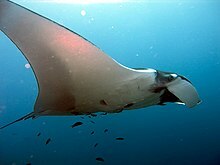 In June 1995, the Maldives banned the export of all ray species and their body parts, effectively putting a stop to manta fishing, as there had not previously been a fishery for local consumption. The government reinforced this in 2009 with the introduction of two marine protected areas. In the Philippines, the taking of mantas was banned in 1998, but this was overturned in 1999 under pressure from local fishermen. Fish stocks were surveyed in 2002, and the ban was reintroduced. The taking or killing of mantas in Mexican waters was prohibited in 2007. This ban may not be strictly enforced, but laws are being more rigidly applied at Isla Holbox, an island off the Yucatán Peninsula, where manta rays are used to attract tourists. In 2009, Hawaii became the first of the United States to introduce a ban on the killing or capturing of manta rays. Previously, no fishery for mantas existed in the state, but migratory fish that pass the islands are now protected. In 2010, Ecuador introduced a law prohibiting all fishing for manta and other rays, their retention as bycatch, and their sale. 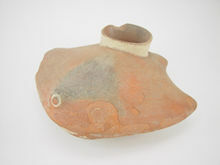 The ancient Peruvian Moche people worshipped the sea and its animals. Their art often depicts manta rays. 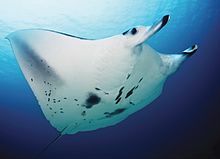 Historically, mantas were feared for their size and power. Sailors believed that they ate fish and could sink boats by pulling on the anchors. This attitude changed around 1978, when divers around the Gulf of California found them to be placid and that they could interact with the animals. Several divers photographed themselves with mantas, including Jaws author Peter Benchley. The Tampa Bay Rays baseball team derives its name from the animals. Due to their size, mantas are rarely kept in captivity and few aquaria currently display them. One notable individual is "Nandi", a manta ray which was accidentally caught in shark nets off Durban, South Africa, in 2007. Rehabilitated and outgrowing her aquarium at uShaka Marine World, Nandi was moved to the larger Georgia Aquarium in August 2008, where she resides in its 23,848-m3 (6,300,000-US gal) "Ocean Voyager" exhibit. A second manta ray joined that aquarium's collection in September 2009, and a third was added in 2010. The Atlantis resort on Paradise Island, Bahamas, hosted a manta named "Zeus" that was used as a research subject for 3 years until it was released in 2008. The Okinawa Churaumi Aquarium also houses manta rays in the "Kuroshio Sea" tank, one of the largest aquarium tanks in the world. The first manta ray birth in captivity took place there in 2007. Although this pup did not survive, the aquarium has since had the birth of three more manta rays in 2008, 2009, and 2010. Sites at which manta rays congregate attract tourists, and manta viewing generates substantial annual revenue for local communities. :19 Tourist sites exist in the Bahamas, the Cayman Islands, Spain, the Fiji Islands, Thailand, Indonesia, Hawaii, Western Australia and the Maldives. Mantas are popular because of their enormous size and because they are easily habituated to humans. Scuba divers may get a chance to watch mantas visiting cleaning stations and night dives enable viewers to see mantas feeding on plankton attracted by the lights. In 2014, Indonesia brought in a fishing and export ban, as it has realized that manta ray tourism is more economically beneficial than allowing the fish to be killed. A dead manta is worth $40 to $500, while manta ray tourism can bring in $1 million during the life of a single manta ray. Indonesia has 5.8 million m2 (2.2 million mi2) of ocean, and this is now the world's largest sanctuary for manta rays. ^ a b "Manta Bancroft 1829 (manta)". Paleobiology Database. Retrieved 13 May 2013. Click on "Age range and collections". ^ Bancroft, Edw. Nath. (1829). "On the Fish known in Jamaica as the Sea-Devil". The Zoological Journal. 4: 444–457. ^ a b c George Dvorsky. "Giant Manta Rays Are More Badass Than We Realized". Gizmodo. ^ a b c Dean, M. N.; Bizzarro, J. J.; Summers, A. P. (2007). "The evolution of cranial design, diet, and feeding mechanisms in batoid fishes". Integrative and Comparative Biology. 47 (1): 70–81. doi:10.1093/icb/icm034. PMID 21672821. ^ "Manta". Collins English Dictionary – Complete & Unabridged (11th ed.). HarperCollins Publishers. ^ Parsons, Ray (2006). Sharks, Skates, and Rays of the Gulf of Mexico: A Field Guide. Univ. Press of Mississippi. ISBN 978-1-60473-766-0. ^ Froese, R.; Pauly, D.l, eds. (2011). "Family Myliobatidae – Eagle and manta rays". FishBase. Retrieved 9 February 2013. ^ White, W. T.; Corrigan, S.; Yang, L.; Henderson, A. C.; Bazinet, A. L.; Swofford, D. L.; Naylor, G. J. P. (2017). "Phylogeny of the manta and devilrays (Chondrichthyes: mobulidae), with an updated taxonomic arrangement for the family". Zoological Journal of the Linnean Society: zlx018. doi:10.1093/zoolinnean/zlx018. ^ Martin, R. A. "Manta Ray (Manta birostris) FAQ". ReefQuest Centre for Shark Research. Retrieved 23 April 2013. ^ a b c d e f Marshall, A. D.; Compagno, L. J. V.; Bennett, M. B. (2009). "Redescription of the genus Manta with resurrection of Manta alfredi (Krefft, 1868) (Chondrichthyes; Myliobatoidei; Mobulidae)". Zootaxa. 2301: 1–28. ISSN 1175-5326. ^ Froese, R.; Pauly, D., eds. (2011). "Genus: Mobula". FishBase. Retrieved 9 February 2013. ^ a b c d e f g h i j k "Manta". Florida Museum of Natural History. Retrieved 11 November 2009. ^ a b "Database of Fishes". California Academy of Sciences. Archived from the original on 3 May 2015. Retrieved 23 April 2013. Check genus and type "Manta" in search box. ^ Whitley, G. P. (1936). "The Australian devil ray, Daemomanta alfredi (Krefft), with remarks on the superfamily Mobuloidea (order Batoidei)". Australian Zoologist. 8 (3): 164–188. ^ Clark, Timothy Brian (2002). Population Structure of Manta Birostris (Chondrichthyes:Mobulidae) from the Pacific and Atlantic Oceans. Texas A & M University. ^ a b c d e Marshall, A.; Kashiwagi, T.; Bennett, M.B. ; Deakos, M.; Stevens, G.; McGregor, F.; Clark, T.; Ishihara, H. & Sato, K. (2011). "Manta alfredi". The IUCN Red List of Threatened Species. IUCN. 2011: e.T195459A8969079. doi:10.2305/IUCN.UK.2011-2.RLTS.T195459A8969079.en. Retrieved 25 December 2017. ^ a b c d e f g Marshall, A.; Bennett, M.B. ; Kodja, G.; Hinojosa-Alvarez, S.; Galvan-Magana, F.; Harding, M.; Stevens, G. & Kashiwagi, T. (2011). "Manta birostris". The IUCN Red List of Threatened Species. IUCN. 2011: e.T198921A9108067. doi:10.2305/IUCN.UK.2011-2.RLTS.T198921A9108067.en. Retrieved 25 December 2017. ^ Ito, T.; Kashiwagi, T. (2010). "Morphological and genetic identification of two species of manta ray occurring in Japanese waters: Manta birostris and M. alfredi". Report of Japanese Society for Elasmobranch Studies. 46: 8–10. ^ Cicimurri, D. J.; Knight, J. L. (2009). "Late Oligocene sharks and rays from the Chandler Bridge Formation, Dorchester County, South Carolina, USA". Acta Palaeontologica Polonica. 54 (4): 627–647. doi:10.4202/app.2008.0077. ^ a b c d e f g Ebert, David A. (2003). Sharks, Rays, and Chimaeras of California. University of California Press. ISBN 978-0-520-23484-0. ^ a b "Mantas at a glance". The Manta Trust. 2013. Archived from the original on 3 January 2013. Retrieved 16 February 2013. ^ a b c d e f g h i j Deakos, Mark R. (2010). Ecology and social behavior of a resident manta ray (Manta alfredi) population off Maui, Hawai'i (Ph.D. thesis). ResearchGate. Retrieved 1 February 2017. ^ a b Ari, C.; Correia, J. (2008). "Role of sensory cues on food searching behavior of a captive Manta birostris (Chondrichtyes, Mobulidae)". Zoo Biology. 27 (4): 294–304. doi:10.1002/zoo.20189. PMID 19360625. ^ Ari, C. (2011). "Encephalization and brain organization of mobulid rays (Myliobatiformes, Elasmobranchii) with ecological perspectives". Open Anatomy Journal. 3: 1–13. doi:10.2174/1877609401103010001. ^ Ari, C.; D'Agostino, D. P. (11 March 2016). "Contingency checking and self-directed behaviors in giant manta rays: do elasmobranchs have self-awareness?". Journal of Ethology. Springer. 34 (2): 167–174. doi:10.1007/s10164-016-0462-z. Retrieved 20 March 2017. ^ Alexander, R. L. (1996). "Evidence of brain-warming in the mobulid rays, Mobula tarapacana and Manta birostris (Chondrichthyes: Elasmobranchii: Batoidea: Myliobatiformes)". Zoological Journal of the Linnean Society. 118 (2): 151–164. doi:10.1111/j.1096-3642.1996.tb00224.x. ^ Braun, C. D.; Skomal, G. B.; Thorrold, S. R.; Berumen, M. L. (6 February 2014). "Diving behavior of the reef manta ray links coral reefs with adjacent deep pelagic habitats". PLOS ONE. 9 (2): e88170. Bibcode:2014PLoSO...988170B. doi:10.1371/journal.pone.0088170. ^ Thorrold, S. R.; Afonso, P.; Fontes, J.; Braun, C. D.; Santos, R. S.; Skomal, G. B.; Berumen, M. L. (1 July 2014). 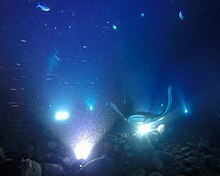 "Extreme diving behaviour in devil rays links surface waters and the deep ocean". Nature Communications. 5 (4274): 4274. Bibcode:2014NatCo...5E4274T. doi:10.1038/ncomms5274. PMC 4102113. PMID 24983949. ^ Webb, J. (1 July 2014). "Deep dives of devil rays solve 'mystery' of warm brain". BBC. Archived from the original on 9 July 2014. ^ a b Yano, K.; Sato, F.; Takahashi, T. (1999). "Observations of mating behavior of the manta ray, Manta birostris, at the Ogasawara Islands, Japan". Ichthyological Research. 46 (3): 289–296. doi:10.1007/BF02678515. ^ Compagno, Leonard J. V.; Ebert, David A.; Smale, Malcolm J. (2008). "Reproduction in cartilaginous fish". Biodiversity Explorer. Iziko Museums of Cape Town. Retrieved 12 February 2013. ^ a b Marshall, A. D.; Bennett, M. B. (2010). "Reproductive ecology of the reef manta ray Manta alfredi in southern Mozambique". Journal of Fish Biology. 77 (1): 185–186. doi:10.1111/j.1095-8649.2010.02669.x. PMID 20646146. ^ Tomita, T.; Toda, M.; Ueda, K.; Uchida, S.; Nakaya, K. (2012). "Live-bearing manta ray: how the embryo acquires oxygen without placenta and umbilical cord". Biology Letters. 8 (5): 721–724. doi:10.1098/rsbl.2012.0288. PMC 3440971. PMID 22675137. ^ a b Marshall, A.; Kashiwagi, T.; Bennett, M. B.; Deakos, M.; Stevens, G.; McGregor, F.; Clark, T.; Ishihara, H. & Sato, K. (2008). "Manta alfredi, Reef Manta Ray". The IUCN Red List of Threatened Species. p. 7. Retrieved 11 February 2017. ^ a b c d Marshall, A. D. (2008). Biology and Population Ecology of Manta Birostris in Southern Mozambique (Ph.D. thesis). University of Queensland. ^ White, W. T.; Giles, J.; Dharmadi; Potter, I. (2006). "Data on the bycatch fishery and reproductive biology of mobulid rays (Myliobatiformes) in Indonesia". Fisheries Research. 82 (1–3): 65–73. doi:10.1016/j.fishres.2006.08.008. ^ Deakos, M. (2010). "Paired-laser photogrammetry as a simple and accurate system for measuring the body size of free-ranging manta rays Manta alfredi". Aquatic Biology. 10: 1–10. doi:10.3354/ab00258. ^ Jaine, Fabrice R. A.; Couturier, Lydie I. E.; Weeks, Scarla J.; Townsend, Kathy A.; Bennett, Michael B.; Fiora, Kym; Richardson, Anthony J. (2012). Sakamoto, Kentaro Q. (ed.). "When giants turn up: sighting trends, environmental influences and habitat use of the manta ray Manta alfredi at a coral reef". PLoS ONE. 7 (10): e46170. Bibcode:2012PLoSO...746170J. doi:10.1371/journal.pone.0046170. PMC 3463571. PMID 23056255. ^ Dewar, H.; Mous, P.; Domeier, M.; Muljadi, A.; Pet, J.; Whitty, J. (2008). "Movements and site fidelity of the giant manta ray, Manta birostris, in the Komodo Marine Park, Indonesia". Marine Biology. 155 (2): 121–133. doi:10.1007/s00227-008-0988-x. ^ Luiz Jr, O. J.; Balboni, A. P.; Kodja, G.; Andrade, M.; Marum, H. (2009). "Seasonal occurrences of Manta birostris (Chondrichthyes: Mobulidae) in southeastern Brazil". Ichthyological Research. 56 (1): 96–99. doi:10.1007/s10228-008-0060-3. ISSN 1616-3915. ^ "Support inclusion of the Giant Manta (M. birostris) in CMS Appendix I & II as proposed by the Government of Ecuador (I/5)" (PDF). sharkadvocates.org. Archived from the original (PDF) on 4 June 2013. Retrieved 11 January 2013. ^ a b "Manta Fisheries". Manta Trust. 2011. Archived from the original on 27 January 2013. Retrieved 21 February 2013. ^ Radford, B. (22 September 2012). "Unproven Chinese Medicine Killing Manta Rays". Discovery News. Retrieved 13 April 2013. ^ "Sri Lanka Manta Project". The Manta Trust. 2011. Archived from the original on 27 January 2013. Retrieved 21 February 2013. ^ "Manta Hotspots". The Manta Trust. 2011. Archived from the original on 27 January 2013. Retrieved 21 February 2013. ^ "Bycatch". The Manta Trust. 2011. Archived from the original on 27 January 2013. Retrieved 21 February 2013. ^ "COP10 Outcome: Migratory Manta Ray under CMS Protection". Convention on Migratory Species. UNEP; CMS. 25 November 2011. Retrieved 19 February 2013. ^ Buczynski, B. (30 November 2011). "Giant Manta Ray Earns Protection Under International Treaty". Care 2. Retrieved 3 December 2011. ^ "The Manta Trust Homepage". The Manta Trust. Retrieved 9 March 2011. ^ Berrin, Kathleen (1997). The Spirit of Ancient Peru: Treasures from the Museo Arqueológico Rafael Larco Herrera. Thames and Hudson. ISBN 978-0-88401-092-0. ^ Ellis, Richard (2004). Monsters of the Sea. Lyons Press. ISBN 978-1-59228-967-7. ^ "The Georgia Aquarium is excited to welcome Nandi, the manta ray!". George Aquarium.org. Archived from the original on 29 November 2014. Retrieved 13 May 2013. ^ "Georgia Aquarium Welcomes Second New Manta Ray". Georgia Aquarium.org. 3 September 2009. Archived from the original on 31 January 2012. Retrieved 3 September 2009. ^ "Georgia Aquarium Welcomes Third Manta Ray". George Aquarium.org. 22 April 2013. Archived from the original on 3 March 2012. Retrieved 3 September 2009. ^ "Giant manta ray released after years of research". USAToday.com. 8 May 2008. Retrieved 16 May 2013. ^ a b c Lück, Michael (2008). The Encyclopedia of Tourism and Recreation in Marine Environments. CABI. ISBN 978-1-84593-350-0. ^ a b Anderson, R. C.; Adam, M. S.; Kitchen-Wheeler, A.-M.; Stevens, G. (2011). "Extent and economic value of manta ray watching in Maldives". Tourism in Marine Environments. 7 (1): 15–27. doi:10.3727/154427310X12826772784793. ^ "Kona, Hawaii Scuba Diving". Kona Honu Diving. Retrieved 14 March 2013. ^ Mason, Margie (21 February 2014). "Indonesia hopes to cash in on manta ray tourism". 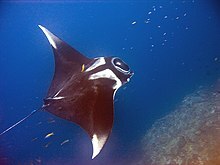 Wikimedia Commons has media related to Manta (genus). Meet the Maldivian Mantas Manta Trust.